It's a brand new school year and Junie B. enters the first grade--meaning shehas to get used to a whole new classroom, a new teacher, and a whole bunch ofstrange children. 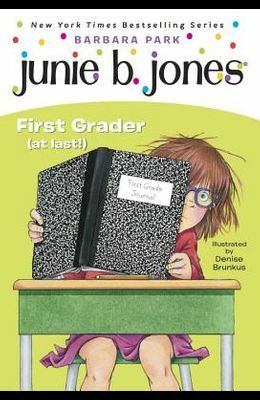 But the worst thing is when Junie B. tries to read words onthe chalkboard, she can't seem to see what everyone else does. Does this meanshe'll have to wear glasses? Illustrations. From the front Cover A Junie B. Jones Book, #18 Hurray, hurray for a brand-new school year! Only, for Junie B. Jones, things are not actually that pleasant. 'Cause first grade means having to get used to a whole new classroom. And a whole new teacher. And a whole new bunch of strange children. But here's the worst thing of all: when Junie B. tries to read words on the chalkboard, she can't seem to see what everyone else is seeing! Is it possible she might actually end up wearing glasses?